Today has been a nice day, a day I have been waiting for. I typically have Fridays off, but for some reason, today really feels like a day off. 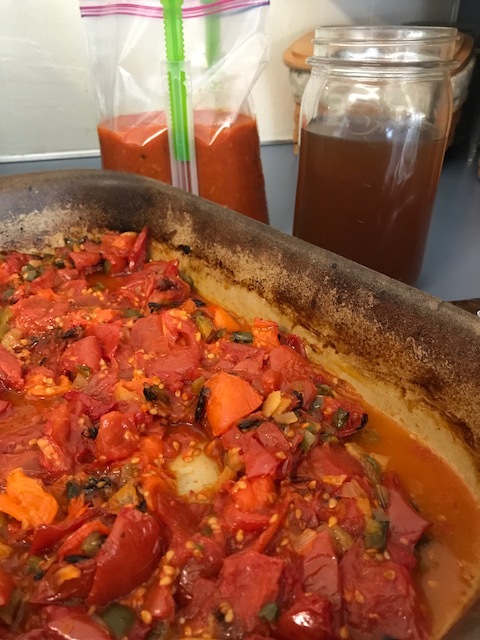 I have been domesticated today, cleaning, making homemade veggie broth (check out this link from a local farm that shared how to do this as well as a printable PDF they made), and prepping some tomatoes for freezing. My house smells amazing! The roasted tomato recipe was told to me by a friend and it is so good! It looked so pretty when I put it in the oven too. I will have to ask her if it is okay to share the recipe, but yum! So what makes today different? God! I know most Fridays I could choose to do the same type of things, but lately I have had so much on my to-do list that I would get overwhelmed and just get a few things done.Today is no different, there are PLENTY of things to do on my to-do list, but for some reason I have had a calm about me. I know there will always be something else I need to put on the list and then check off, but today, taking time to do domestic type things like this was what I needed today. You see, I have two jobs, which I do enjoy, but I miss being home. I was a stay at home mom most of the time my kids were little and slowly added more hours as they began to grow. This has been a transition all in itself. I have been working for my friend Amy, for 9 years today. Yep, nine years and I am still getting used to working. Ha! I recently started working as a Ministry Assistant for our church too (which I really enjoy), so now I am gone four pretty full days. I know many of you are thinking, “Four full days is nothing, I work way more than that.” However, for me, this has been a huge change. I have always been the mom who is home during most of the day, the mom who greets their children at the door when they return from school, the mom who could volunteer to help during the day, and so on, you get it. I am now a working mom who gets home in time to make dinner and then help us as we rush to the next activity. Rehearsals for Drama Club, Band Booster meetings, Board meetings, concerts, and so on. Our lives seem to be pretty full right now. I have adjusted pretty well, but I do miss days of less chaos, a house that is most always clean and tidy and the laundry caught up. I miss the times with my kiddos after school as they would fill me in about their day, help them through their homework and make dinner at a pleasant pace. Working has been good for me, giving me a new sense of purpose and using the abilities God has given me in different areas of my life. I never really thought about working when my kids were younger, but I am sure I was discontent about the lonely times at home wishing for human contact above two feet tall. LOL! It is hard to remember those days though. My son is a freshman in college and my daughter a freshman in High School. Wow, time flies fast. Wasn’t I just in college a few years ago? Ehem. So, today I am thankful for time to be in my home feeling a little like it was years ago. My house won’t be as clean as I want by the end of the day, and most likely I will be putting the sheets on the bed last minute so we can crawl in later tonight. However, I will celebrate in the veggie broth, tomatoes and the freshly cleaned sheets for today. I was talking to my friend and “boss” yesterday about feeling overwhelmed, like I just couldn’t do anything well because I was spreading myself too thin. I wasn’t complaining, but just feeling a bit defeated and discouraged. Wouldn’t you know it, but God listened and heard my cry for some peace.Today,is God’s gift to me! He knew I needed rest and time to recuperate. God is so awesome, that he hears even little prayers of overwhelm and discouragement. I am so thankful for a loving God who hears me and listens to my heart. What are you thankful for this Friday?